The Graci estate is located on the Northern slope of Mount Etna at Passopisciaro, an area where viticulture goes back several thousand years. The vineyards are at an elevation between 1800 and 3000 feet above sea level Planting density ranges between 6,000 and 10,000 vines per hectare. Some of the vines are on their own roots, and not grafted. One of the three vineyards is located in Contrada Arcurìa in Passopisciaro. Arcurìa is a single property in the heart of the Etna DOC that extends for 52 acres – ranging in elevations between 1800 and 2000 feet a.s.l. Currently, 36 acres are planted with vines, 30 acres with Nerello Mascalese , 3 acres with Carricante and about 2.5 acres with Catarratto. In one section of the vineyard, the vines are spaced 3 feet apart in each row and there are 7 feet between rows. The other section is ungrafted ‘alberello’ (head plant) planted 3.3 feet apart, giving a total density of 5,000 vines per acre. The second smaller vineyard is located in Contrada Barbabecchi in Solicchiata This small property of just 4 acres is planted with Nerello Mascalese and it is at an elevation between 3,000 and 4,200 feet above sea level. These vines were planted over 100 years ago before the phylloxera epidemic that destroyed most vineyards in Europe in the late 1800’s. Naturally, these are ungrafted vines with their own roots. The remainder of the property is planted with Olives and Apples. At this high elevation the grapes are picked in November. These grapes don’t receive any treatments whatsoever- even those approved by the organic farming standards. The Barbabecchi vineyard produces an austere, very special wine of great depth. The new vineyard of Contrada Feudo di Mezzo is just 3 acres and will be planted in 2008 exclusively with indigenous varietals: Nerello Mascalese and Nerello Cappuccio for reds and Carricante and Catarratto for whites. Intervention of any kind will be very limited, both in the vineyard and in the cellar. Herbicides are not used in order to leave the unique balance and vital energy of this soil unaltered. Graci does not use standard barriques, but only vertical large wooden ‘tini’ and large, well-seasoned wooden barrels. Their sole objective is to reflect the personalities of the vineyards and the differences between the different harvests. At these elevations, the climatic seasonal changes can be radical and this is the real treasure of the territory. 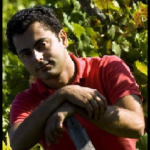 The Nerello Mascalese manages these changes well and never cease to amaze and thrill the wine maker. It is this great adaptability that drives the winemaker to make wines which are true to and expressive of their real nature. Etna Rosso, "Feudo di Mezzo"